Model Camilla Hansen is an Advocate For Finding Your Own Personal Style, Embracing Your Creativity & Helping Animals. Camilla Hansen is a plus model who is originally from a small village in Southern Denmark. She started modeling at fourteen years old as a straight model. After four years, she changed to plus modeling. She has lived in Istanbul and Milan, and currently lives in New York City. She is represented by Model Management UK in London and Wilhelmina in New York, Miami, and Los Angeles. Some of her clients include Marina Rinaldi, Elena Mirò, Jessica London, Macy’s, Fiorella Rubino, Avenue, Ulla Popken, Burda, Persona, and Bloomingdales. Her hobbies include fostering and volunteering for an animal rescue center in New York, photographing, and getting lost in new cities. I started my career as a model when I was fourteen years old. A few friends had suggested that I should contact an agency, and after a while, I decided to try it out. I sent some pictures to an agency in Copenhagen (the capital in Denmark) but because I feared rejection, I did it without telling anyone at all–not even my family. The same day the agency received my pictures (which by the way were just random personal shots); they called me up and told me about a modeling competition that they had going on at that moment and that they wanted me to be a part of. I, of course, was so excited and immediately accepted. After that, everything happened very fast. I told my family about the happy news and a few days later, we went to Copenhagen to attend the casting for the finals. I became one of ten finalists out of thousands of applicants and a few days after the casting, the finale was held. I won. What I enjoy most about modeling is not just one thing. It is the combination of several things. Getting to travel and experiencing new cultures. Getting to unleash my creative side and being inspired by all the creative people around me. Hopefully, inspiring young girls to accept their body as it is. These are just a few of the things that I enjoy about modeling. Have you ever suffered from self-esteem or body image issues? If so, what advice would you give to young girls and women who are currently struggling? I have indeed suffered from low self-esteem and body image issues. When I started modeling, I was constantly told by agents and a majority of clients that I was too fat and that I had to lose weight. Even though my parents have always had my back and have supported me throughout my career, you will reach a point where it is just too difficult to ignore the comments being made about your body and unfortunately, I started believing what they said was true. All of a sudden when I looked in the mirror, I no longer saw that slim girl that I previously had seen. Instead, I started seeing all the problems that everyone, except my family, kept bringing to my attention. When I started modeling, I decided that I would only do it for as long as I found it enjoyable. After four years, I had had enough. Enough of the comments. Enough of the insane diets. Enough of not feeling confident. So, when Wilhelmina wanted to sign me to their plus-size board, I jumped right on. It was my way out. I started eating regularly and healthy, and I stopped weighing myself every day. All of this slowly made me feel happier, both about my body and my life. Rome wasn’t built in a day though, and being confident about your body doesn’t happen overnight. It’s a process, but once you reach that state of mind it is indescribable. Therefore, my advice to any girl/woman is to be YOU. Find your natural size where your body plateaus whether that is a size 0, 12, 22, apple shape, pear shape, hourglass, or whatever and rock that. The most beautiful, attractive, and intriguing women that I have met in my life so far, may not necessarily have met the fashion industry’s criteria on what beauty is but they were comfortable in their own skin and for that I admire them. I definitely feel plus modeling is helping redefine beauty, but as is acting, etc. Nowadays, it has become more common to see women of all shapes and sizes on the cover of and in various magazines, as well as in TV series. The fashion industry has (hopefully!) realized that consumers need and want to see someone they can relate to. Healthy, to me, is eating healthy and regularly. Healthy, to me, is a state of mind. Healthy, to me, is taking care of your body. What do you wish you would have known at age thirteen? Here is the thing. I try as much as possible to live a life with no regrets. I am happy with who I have become so why regret any of the things, both the good and the bad, that have been part of that process? When I was thirteen, I was still a child and I learn by doing, so I don’t wish I knew anymore than I did because then I very likely wouldn’t have gone down the path I have. What feature do you love to accentuate? It depends what mood I am in. Sometimes, it is my legs and other times it is my waist or my bust. It depends. A way of expressing my creativity. I am not a great writer, painter, or dancer, but I still have such an incredible amount of ideas and visions in my head that I need to get them out somehow. That’s what photography does for me. We know you love heels! Do you have a favorite pair? Ha ha, I do indeed! My dad’s nickname for me is Imelda Marcos. I feel that heels can make or break an outfit, especially as I hardly ever wear jewelry. This is also, why I don’t have a favorite pair of shoes. I love all of them, as they are all good for different occasions and outfits. I actually don’t have a specific go-to outfit. In the Fall/Winter, I wear a lot of black and there is a certain model of black Dr. Denim jeans I wear quite often. I actually have own three pair of the same model because I wear them so often and love them a ton. During Spring/Summer, I try to switch it up a bit by wearing cute and colorful dresses that accentuate my curves. I don’t have any style icons. I believe in wearing what is comfortable yet flattering to my body shape. Once again, it is all about being YOU instead of trying to imitate other people. Have you always been a dog lover? Do you have any dogs now? I have always been an animal lover, not just a dog lover. I had rabbits when I was still living at home and I rode horses for a very long time, which by the way, to this day is the best sport I have ever partaken in. Though I always took care of a lot of dogs, I never had my own dog and I don’t plan on getting one in the near future as it is a huge responsibility, and I am not at the stage in my life where I am able to make a ten to twenty year commitment. When the time is right, I will (without a doubt) get my own dog, but that is just not now. Instead, I decided a while back to start fostering for a dog rescue (Posh Pets Rescue) here in New York. That has been a great decision. Basically, what we do is to take the dogs off the euthanizing list, out of the shelters and place them in private homes until they are adopted. In periods when I am not working, I will usually have one or two dogs at my apartment. It keeps amazing me how people can give up these dogs, as most of them are perfectly healthy and well-behaved dogs that have just been dumped on the street, as if they were a useless bag of garbage. When I got my first foster dog, Rosie, a beautiful, well-behaved, housebroken, and kindhearted Bichon Fris, I was heartbroken. How could anyone just leave this little gem to fend for herself on the street? I was close to losing faith in humanity, but then something amazing happened. Rosie was put up on our website (www.poshpetsrescue.org), on petfinder.com, and on several other sites and the applications just started rolling in. 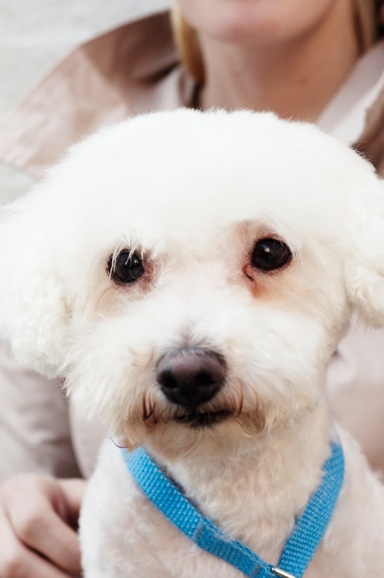 As they say, one man’s trash is another man’s treasure and after going through a lot of applications and interviews little Rosie was adopted by an incredibly sweet woman who already had another Bichon. All of these applications made me realize that even though there will always be the occasional cold-hearted person there are at least twenty good ones! My parents and grandparents. For the love and unlimited support they have always given me, my younger brother, and each other. I strive to be like them. Your family is a big part of your life. What is one of your favorite childhood memories? One incident that sticks out, and that I think of often and was a long time ago, is when my brother and I played dress up. Even though he was a boy playing with cars, super heroes, etc., he let me put him in a dress, put makeup on him, and place a big bow in his hair. Only someone who truly loves you will let you do something like that to them. Out of all of the places your modeling career has taken you, where has been the most memorable and why? Every single place I’ve traveled to has made an impact on me as a person. In Texas, I had a Mexican driver who was also a trained chef. He taught me some incredible Mexican recipes. When I lived in Istanbul, a friend and I were almost shot by the mafia. When I went to Colombia for a job, we stayed and shot at a highly guarded mansion and the mother of the house showed me a few traditional Colombian dishes; one of which you have to use at least five different kinds of potatoes. I could go on like this, but my point is, as I said in the beginning, that every place has made an impact on me and who I am as a person today. I believe that it makes us better people to experience and accept the differences in the different cultures all over the world. Anywhere I find anything flattering really; sometimes that is at very cheap stores and other times at more pricey stores. When my grandmother, with whom I was very close, was alive, she used to always tell me: “Smile at the world and the world will smile back at you”. Though she went through some very hard times in her life, she was one of the most genuinely positive people who I have ever met. Because that was one of the things about her I admired the most, I try to live by it even though I do fail sometimes. I don’t just love one part; I love me as a whole. I have finally completely accepted my body as it is and I am happy with whom I am as a person. My very favorite beauty product is a makeup remover from Bioderma. Every time I work, I wear a lot of makeup and it can be very hard on the skin if the makeup remover you use is not good. Do you have a beauty tip to share with us? Being in a business where appearance matters a lot, I attempt to take very good care of my skin. I cleanse my skin every night (no exception) with a milky cream cleanser, then with an alcohol-free skin tonic, and I finish off my routine by applying eye cream and a good lotion. In the morning, I re-apply the lotion which contains SPF 30. That is my best beauty tip–take good care of your skin, even if it may seem like a hassle because it will benefit you in the long run. I naturally have very red lips and therefore don’t wear anything on my lips in my everyday life. Bit, I love to pump it up every now and then with a deep red lipstick (Chanel Rouge Allure – 09 – Lover) if I go out for dinner, an event, or something like that. A perfect day off for me would be spent with my family. Especially after I have moved to New York and they are all in Denmark, it has made me realize just how much we should all treasure the time we have together because you never know when that time might be up. A fun fact about me is that I never liked wearing dresses when I was younger. I always preferred being outside climbing trees and getting dirty. Right at this moment, I am excited about several things. OneStopPlus.com gave New York fashion week its very first plus-size fashion show, and I got to be a part of it, which is something I am very proud of. Elena Miro once again put on an amazingly beautiful and well-done show during Milan fashion week. Last but not least, I am over the moon that I once again got to work with the talented people at Vogue, which resulted in a short-film that should be coming out very soon. **You can watch Camilla’s video and find out more about her at http://www.vogue.it/en/vogue-curvy/how-to/2010/03/camilla-hansen.